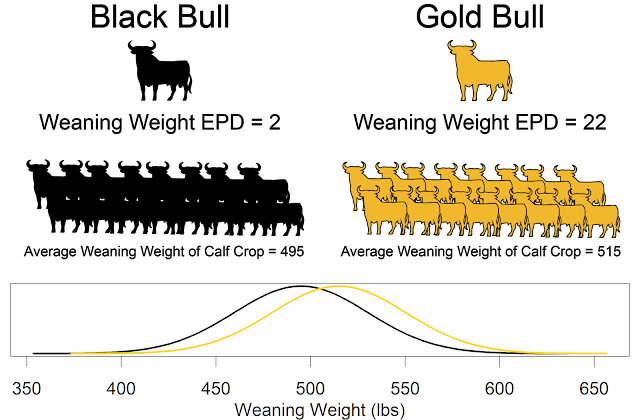 Real-world research utilizing crossbreeding has led to documented real-world results in hybrid female demand compared to straight-bred females. During the recent Circle A Ranch Sale Oct. 19, 29 black-baldie heifers averaged $2,960, and the top-selling lot was black-baldie heifers bred with heifer-calf-confirmed pregnancies at $3,450 each. The average price paid for the 269 straight-bred Angus heifers was $2,431. That’s a crossbred advantage of $529 per head in price. In 2007 Circle A Ranch, Iberia, Mo., began a research project with the American Hereford Association (AHA) designed to determine and measure the advantages of using Hereford genetics on commercial Angus cows. Results from the project documented the Hereford efficiency advantage with a 7% increase in conception rate along with improved feed efficiency and average daily gain. Utilizing the Circle A data, economist Vern Pierce developed an economic model which projected that over a 10-year period, using Hereford bulls on Angus-based females would add $514 net over the life of a cow or approximately $51 per cow per year to a rancher’s bottom line. Now, six years later, Circle A is still crossbreeding and having great success. Circle A’s Nick Hammett says that since the completion of the research project, the ranch has purchased four Hereford bulls that it is utilizing natural service and collecting for artificial insemination. The Hereford bulls are mated to Angus cows, and the resulting crossbred heifers are highly sought-after. Each fall Circle A Ranch offers bred replacement heifers in its production sale, and in recent years, the crossbred heifers have been topping the sale. In an article by Beef Magazine's Burt Rutherford, 17.2% of survey respondents said they added Hereford genetics (up from 12.4% in 2010), 11.9% added Red Angus (up from 8.8% in 2010), 8.8% added Simmental (up from 4.6%), and 8.1% added SimAngus (up from 5.5% in 2010). 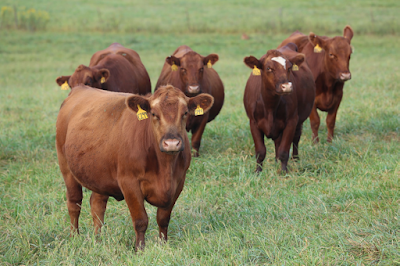 Cattle producers are realizing the 25% increase in lifetime production of a crossbred cow. Adapted from Hereford press release "Hereford-Sired Replacement Average $529 More Than Angus-Sired".